This amazing life size custom made Captain America style shield made of thick dished steel. 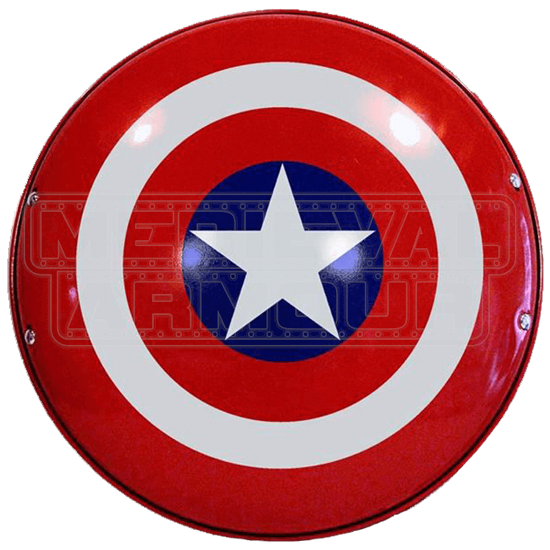 This shield is heavier, stronger, more durable, and more dent-resistant than other Captain America shields, making it a great choice. Like Captain Americas real shield, it is slightly concave or domed shaped, similar to the traditional Greek hoplite shields of old. A flat brace has been attached to the back to make carrying and wielding the shield more comfortable. Heavy leather straps are used to secure the arm along the back one going over the forearm and one intended to be gripped or held. They are spaced about 11 inches apart and positioned to provide optimum balance when holding the shield. This is also much more comfortable than other shield strap systems. The Steel Captain America Shield has also been applied with a coat of topcoat clear coat to further protect and preserve it from wear. This shield measures a large 27 inches in diameter, and it weighs 8 pounds and 7 ounces. Do not overpay for one of those cookie cut manufactured shields. Get a stronger and more durable one right here while you can! This Steel Captain America Shield would be perfect for any Comic Convention or crime fighting situation that might arise. The Captain America Shield is made of steel making it fully functional, though probably not bulletproof.